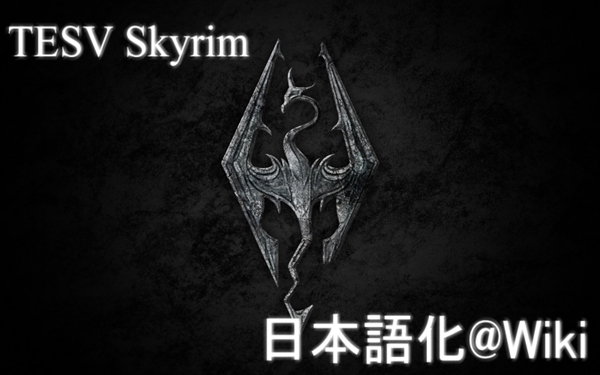 Skyrim Japanese Translation Wiki (SkyrimJP) is neither directly nor indirectly related to Bethesda Softworks, nor parent company ZeniMax Media, in any way, shape, or form, neither does the SkyrimJP claim any representative rights to such. The SkyrimJP is an entirely non-profit site and currently maintains no monetary value. Its purpose is that of an open information repository and is not intended to infringe upon the copyrights of Bethesda Softworks, nor their parent and affiliate companies. This site is neither supported nor endorsed by Bethesda Softworks or its licensers. All information on this website is provided "as is" without warranty of any kind, express or implied, including the implied warranties of non-infringement. The SkyrimJP cannot guarantee the validity of any information contained herein and disclaims the accuracy of submitted information, said information being posted without immediate peer review, and open to modification via any third-party. In no event will the SkyrimJP, its host, contributors, sponsors, administrators, sysops, nor editors, formal or otherwise, be liable to any party for any direct, indirect, privileged or consequential damages occurring as a result of the use of this website or the content therein; neither shall any of the aforementioned be liable for damages occurring as a result of hyperlinked or otherwise affiliated sites, said damages including, and without limitation, any lost profits, business or personal interruption, loss of data on your information handling system, or otherwise, even should we be expressly advised of the possibility of such. All information supplied herein is provided freely with no guarantee of accuracy, neither is there any guarantee that said information has been submitted by an expert in a legal manner. Furthermore, the SkyrimJP may contain information of a nature revealing particulars concerning Elder Scrolls literature and games ("spoilers") and information deemed objectionable or offensive to certain parties, all of which the SkyrimJP disclaims the responsibility of advisability towards. While a limited license to copy and distribute the contents of this site is in effect, save where certain trademarked contents are concerned, this license does not imply any kind of contractual liability on the part of the SkyrimJP, its agents, members, organizers, or other users. The SkyrimJP disclaims responsibility for any materials submitted herein by yourself, it being understood that such information has been given freely and is incorporated thereafter under the Attribution-ShareAlike 2.5 License, insofar as relates to the content. Furthermore, the SkyrimJP disclaims any responsibility towards said data should it be changed, edited, or in any way modified by an outside party. The use of trademarked content at the SkyrimJP does not imply that this information may be freely used by any other party, neither does it imply an endorsement by the trademark holder to do so. Unless otherwise noted, the SkyrimJP holds and can grant no rights to the use of any protected information or materials on this site. Bethesda Softworks, XnGine, Arena, Daggerfall, Battlespire, Redguard, Morrowind, Tribunal, Bloodmoon, Oblivion and The Elder Scrolls are registered trademarks of ZeniMax Media Incorporated © 1994-2006. GameBryo is a registered trademark of Emergent Game Technologies. All other content is trademark or registered trademark of its respective owners.